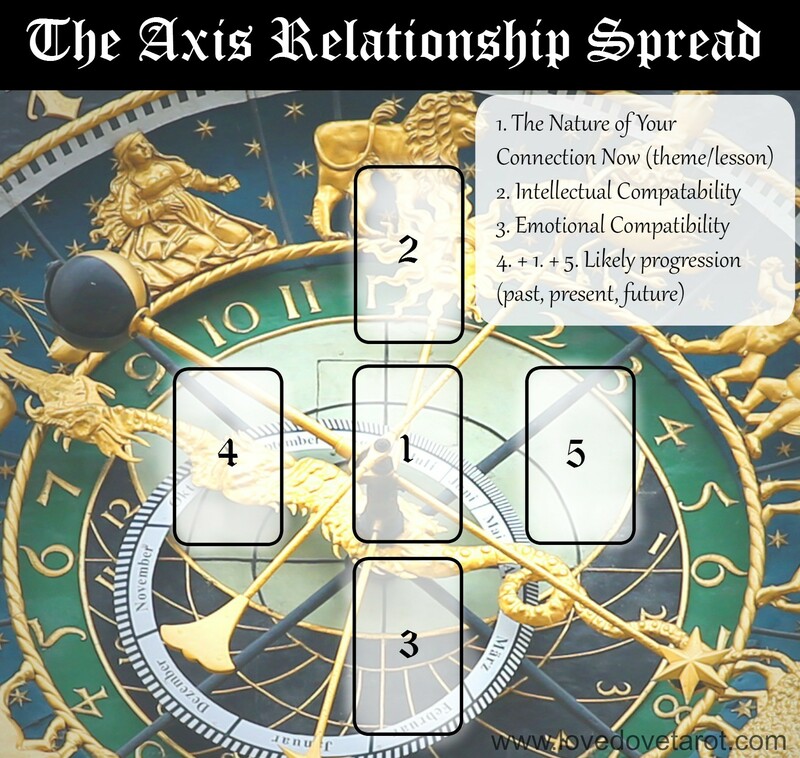 This is not really a new Tarot spread – I have already shared versions of it on the blog… This is more of a ‘how to’… Today I want you to get a different feel for this traditional star layout when used for an overview of the relationship. In essence, at a glance, you get the same type of information from this type of Tarot spread as a summary of your astrological composite chart (where you read on the relationship as its own entity) if done right… but with the added bonus of a forecast of the long-term potential. Look carefully at the cards… first along the vertical and then along the horizontal axis… The vertical axis gives you a clue about the depth of connection; the horizontal axis gives you an overview of how the relationship is most likely to progress and the final card tells you if there is long-term potential as things stand. Now shift your focus to your central card (1). The power to change lies in the now… If you have a strong card here, like Strength or The Sun, you have every opportunity to shift the future in your favour if you do not like the final card. However, whether or not you will want to should really depend on the depth of connection. If card 2 is less than fabulous ask yourself how important a strong intellectual connection is to you and be honest about it. If cards 1-3 line up really wonderfully and the future still looks bleak, this is a relationship you will want to fight for! The 4th card gives you important clues about the foundation of your relationship as this is how you arrived at where you are now (card 1). If the Devil falls here or in position one, it is very likely that this is a connection you are better off without. Really focus on getting a feel for how the energy flows along both axes. Feel free to ask if you get stuck but please note that I cannot interpret full spreads on here (there simply aren’t enough hours in the day!). Questions about individual cards that don’t make sense to you is totally fine though. Hopefully, today’s post will help you understand the flow of reading the cards (for other layouts too!) a bit better. It is very much about getting a feel of how the energy flows between the cards and reading for overview as well as details. I would love to hear how you get on with this spread and look forward to your comments.